Moving to a new country and a new school undertaking a new curriculum hasn't left me much time for pleasure reading this fall, unfortunately. Aside from my book club selection (The Night Circus), most of my reading is devoted to short stories that I can use as mentor texts. In celebration of my favorite month, I am trying to read my students as many scary stories as possible. I was excited to find Neal Shusterman's Darkness Creeping in our school library, as most of my students have read Scary Stories You Can Tell in the Dark more times than I have! The best part of these twenty short stories is that they aren't gory or terrifying, they just have the ability to creep the reader out. My two favorite stories are "Black Box" and "Screaming at the Wall". Both slowly build in suspense, until my students were clutching each other with panicked looks on their faces. It was the incredible ending of "Black Box" that had all my students clamoring to borrow the book and asking me if we could write scary stories for Halloween. 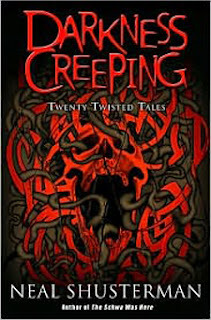 If you're looking for genuine horror, look elsewhere, but if you want to freak out a little, pick up Darkness Creeping.